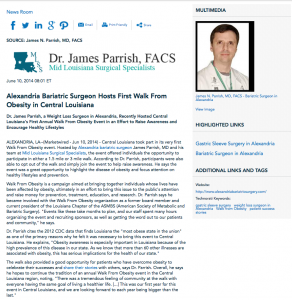 Dr. James Parrish, a weight loss surgeon in Alexandria, recently hosted Central Louisiana’s first annual Walk From Obesity event in an effort to raise awareness and encourage healthy lifestyles. Alexandria, LA — On May 3, 2013, Central Louisiana took part in its very first Walk From Obesity event. Hosted by Alexandria bariatric surgeon James Parrish, MD and his team at Mid Louisiana Surgical Specialists, the event offered individuals the opportunity to participate in either a 1.5 mile or 3 mile walk. According to Dr. Parrish, participants were also able to opt out of the walk and simply join the event to help raise awareness. He says the event was a great opportunity to highlight the disease of obesity and focus attention on healthy lifestyles and prevention. Walk From Obesity is a campaign aimed at bringing together individuals whose lives have been affected by obesity, ultimately in an effort to bring this issue to the public’s attention and raise money for prevention, treatment, education, and research. Dr. Parrish says he became involved with the Walk From Obesity organization as a former board member and current president of the Louisiana Chapter of the ASMBS (American Society of Metabolic and Bariatric Surgery). “Events like these take months to plan, and our staff spent many hours organizing the event and recruiting sponsors, as well as getting the word out to our patients and community,” he says. Dr. Parrish is a weight loss surgeon in Alexandria, LA. He offers bariatric surgery options, including gastric sleeve surgery, gastric bypass, and the LAP-BAND® System. Dr. Parrish is a Fellow of the American College of Surgeons, and he is the current president of the Louisiana Chapter of the American Society of Metabolic and Bariatric Surgery. He has performed minimally invasive abdominal surgeries for over 15 years, and he also has undergone extensive post graduate training in bariatric surgery since 2003. Dr. Parrish is available for interview upon request. To learn more about Dr. Parrish and Mid Louisiana Surgical Specialists, please visit alexandriabariatricsurgery.com.